Beachler, who graduated from Wright State in 2005, is the first African American to receive an Oscar nomination in the Best Production Design category. It is one of seven nominations the film received, including for Best Picture. The Oscars air at 8 p.m. on Feb. 24. Beachler was also the production designer on “Moonlight,” which in 2017 won the Academy Award for Best Picture and the Golden Globe Award for Best Drama. She received the 2017 Art Directors Guild Award for excellence in production design and art direction for her work on “Lemonade,” Beyonce’s visual album that originally aired on HBO. Beachler has been the production designer on “Miles Ahead,” a biographical film based on the life of jazz musician Miles Davis; “Creed,” the seventh film in the “Rocky” series; and “Fruitvale Station,” which won the Grand Jury Prize for Best Film and the Audience Award for Best Film at the Sundance Film Festival in 2013. She was named the 2018 Alumna of the Year by the Wright State Alumni Association. Beachler spent 13 months working on Marvel’s “Black Panther,” overseeing a $30 million art budget and a dedicated crew of several hundred people. She spent two weeks preparing for her job interview with Marvel Studios. She spent $12,000 of her own money, hired a concept illustrator and created her own story, a 400-page book with references and blackboards for her presentation. 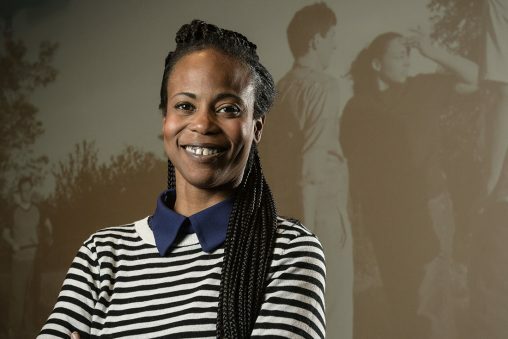 Hannah Beachler spent time with performing arts students during her visit to the university in December 2017. Beachler said the education she received in Wright State’s Motion Pictures Program helped prepare her for her career. She was exposed to many important films and literature, allowing her to talk on the same level as directors do, she said.